Children love learning about animals of all types. From the family dog to the tiger in the local zoo, there's just something exciting and fun about studying our four legged friends (as well as our feathered and finned friends). At FreePrintable.com, we encourage learning in many different ways. In addition to worksheets and lesson plans, we also feel that kids can learn while engaged in creative activities such as crafts and free printable coloring pages. Sometimes, the last thing a student needs is yet another lecture on the whiteboard or a powerpoint presentation. Hands on activities like coloring can reinforce important concepts learned in the day's lessons. They can also expand upon those lessons, teaching students new and advanced skills. Check out the many printables we have for students, teachers and parents to help boost learning for the children in your life. What's your child favorite animal? Is it the lone, mysterious wolf that howls at the moon? How about huge tortoises from the Galapagos islands? Lots of kids are interested in whales and sharks, too. Don't forget about your everyday animals like kittens and ducks – we have all those covered. No matter what your child's interest is, we have suitable free printable coloring books and pages for you to try. These are a much more affordable alternative than buying coloring books about the many different animals from a store. If you're a parent, you know that children are prone to losing things like coloring books and crayons, but when you have coloring books right at your fingertips ready to be printed at a moment's notice, it relieves some of that burden. The majestic tiger was always a personal favorite here. They're beautiful, strong creatures that come in several colors. The traditional coat, of course, is orange and black, but there are beautiful white tigers out there, too, that can take your breath away. These strong, powerful cats are amazing in person, so if you ever get the chance to see tigers in a zoo or sanctuary, go! 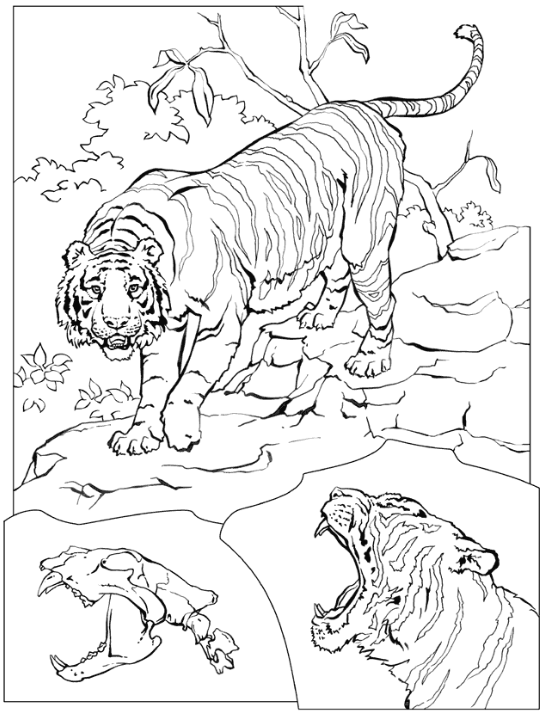 Meanwhile, you can start learning all about tigers using our free printable tiger coloring sheet. It features a tiger on the prowl, walking over a rocky surface. Below the picture of the tiger, you'll find a profile view that shows off its sharp teeth and a profile of its skull to show you just how powerful those feline jaws can really be. To print the coloring page, just click on the "print" button right below the picture. You can also customize the picture by adding your name, date or a fun quote or statistic about tigers. There are several different fonts to choose from, so get creative with it. You can print right from our website or save the image to your computer to print later if you'd like. Be sure to check out our other animal coloring pages, too!